It's that time again where I dig into my vault and share with you a comic from my own personal collection. In fact, this was my latest acquisition. With everyone trying to buy up the modern comics and hoping that they will become valuable and flip them for a profit, the Golden Age of comics is being grossly overlooked. If you take some time and hunt for them, you can find some nice Golden Age gems for well under guide. However, that's not exactly what I did to get this nice mid grade copy of Batman #28, even though I got it for well below guide, it was more of an impulse buy. I frequently shop for comics on eBay. In fact, that's where I get most of my comics from. They have the biggest selection of comics than any other place and often times, it's where you can get the best deals from. One day, I happened to sign into eBay and checked my messages. There was an email from eBay saying that they were doing an 8% eBay Bucks promotion that ended the next day. I went through the pain staking process of searching and trying to decide what, if any, comic I was going to buy to get the extra eBay Bucks. 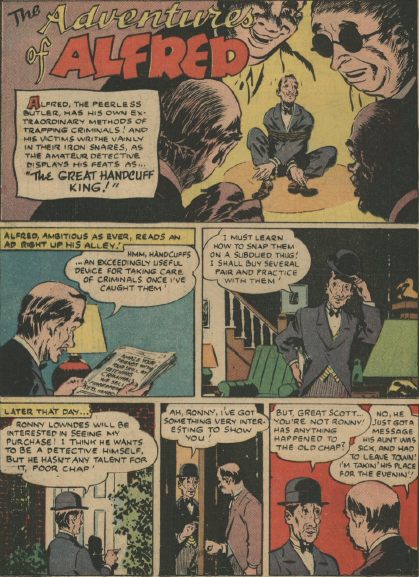 As I was searching through the usual Silver and Bronze Age books that were on my want list, I remembered that I wanted to search for an early Golden Age Batman comic, preferably between issues #1 - #30. I didn't think I was going to find anything that was in my price range, and I was right, I didn't find anything in within my $200 budget. 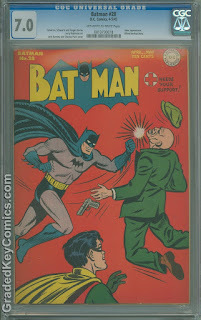 As I was browsing through the Golden age comics, I stumbled upon this copy of Batman, a nice Universal label 7.0. Finding graded copies of early Batman comics aren't easy to find in any grade, never mind in higher grades. The first thing I did was compare the sellers asking price with the latest Overstreet Price Guide. He was asking well below guide price for it, almost $200 below. The next thing I did was check out the CGC census. Since rarity plays an important role in the value of a comic, I had to take this into consideration. There were only a little over 100 copies listed on there, so that looked good to me. Next I had to take into consideration the key issue status. There isn't anything about this comic that screams key issue. CGC lists the key status as "Joker appearance" and "Alfred backup story". That was good to me too. 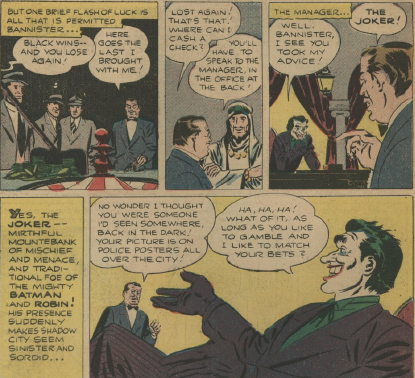 If I were to buy an early Batman comic, I might as well buy one that has an early appearance of the Joker too. The final thing I had to do was check out some recent sales on GoCollect. 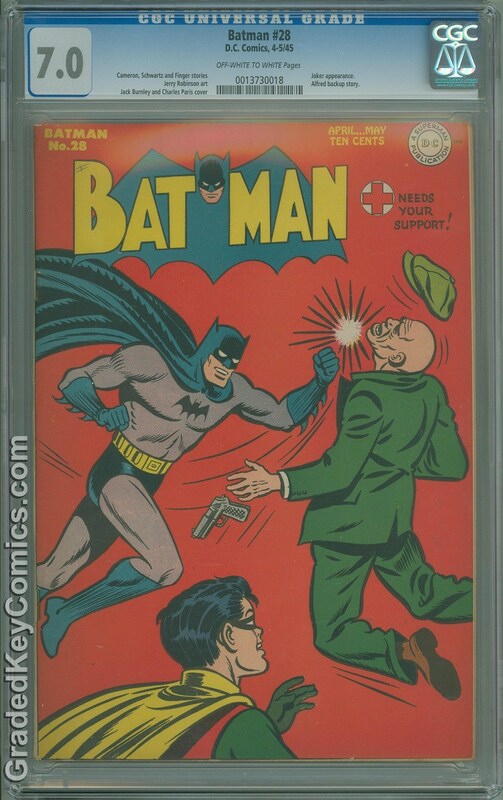 The last sale for a copy of Batman #28 at a 7.0 F/VF sold for close to guide price only six months before. However, in March, two 8.0 VF copies sold for less than that one sale that was graded a 7.0 F/VF. That made me think about it a little bit harder. Was this going to be a good future investment? Ultimately I decided that it was and decided to buy it. Now I had the problem of my meager $200 limit. Between having bills to pay and recently sending a bunch of books off to CBCS to be graded, I had to make sure that I had enough cash. I counted up all of my pennies and made a trip to the bank to make sure I could afford it. At the end of the day, I had enough to by this copy of Batman #28 and have some money left over, and I collected over $50 in eBay Bucks to put toward a future investment. I received the comic in the mail a few days ago and I must say, I'm really glad that I pulled the trigger on it. I can cross that early Batman book off of my want list, but that doesn't mean I won't be buying another one in the future, if I can get it for a good price that is.